Every time I have made this lobster chowder I get compliments. Everyone loves it. My son even asked me for the recipe so I decided to put it into my blog. 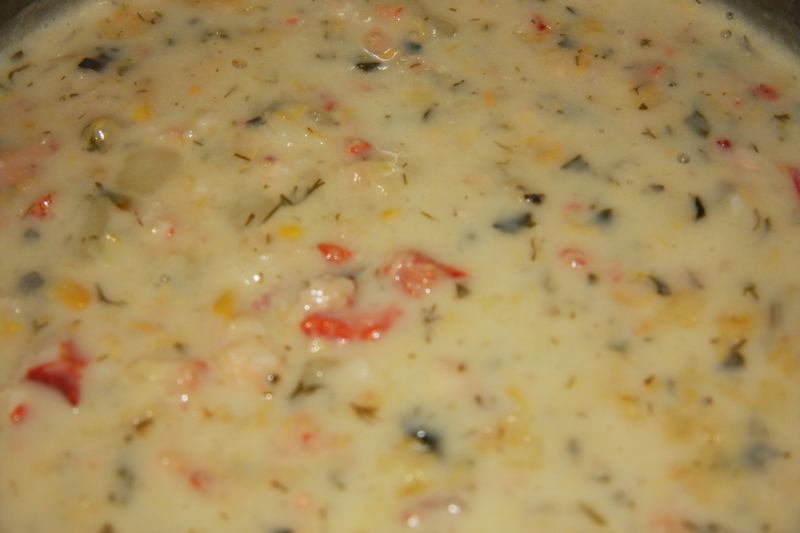 When I first made the chowder, I just couldn’t believe how simple it was but also how tasty it was. When I got the thumbs up from my granddaughter I knew I had a winner. She is my food critic. Seriously, if you like creamed corn, you’ll love this. If you don’t like lobster then add shrimp or scallops. Hey, for that matter omit the seafood and add some cooked chicken OR if you don’t like creamed corn, just add regular corn. Make it to suit your own taste. In 2-3 tablespoons of butter fry one chopped onion. 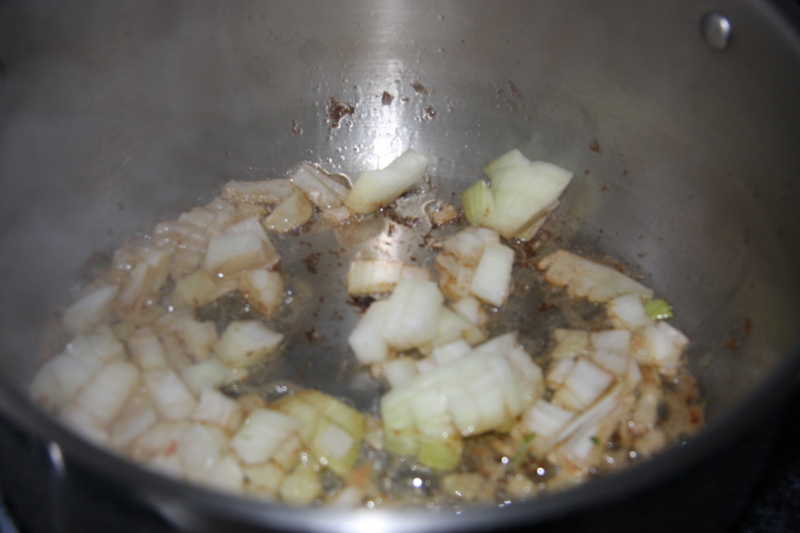 Then grate 1 clove of garlic into this. Fry for a minute or so and add 1 cup of boiling water. Why boiling? That’s so the cooking process will not stop because you have added cold water. Next add 2 cubed potatoes, 1/4 cup chopped parsley, 1/4 cup dill, salt and pepper and even some paprika. Just a sprinkle. 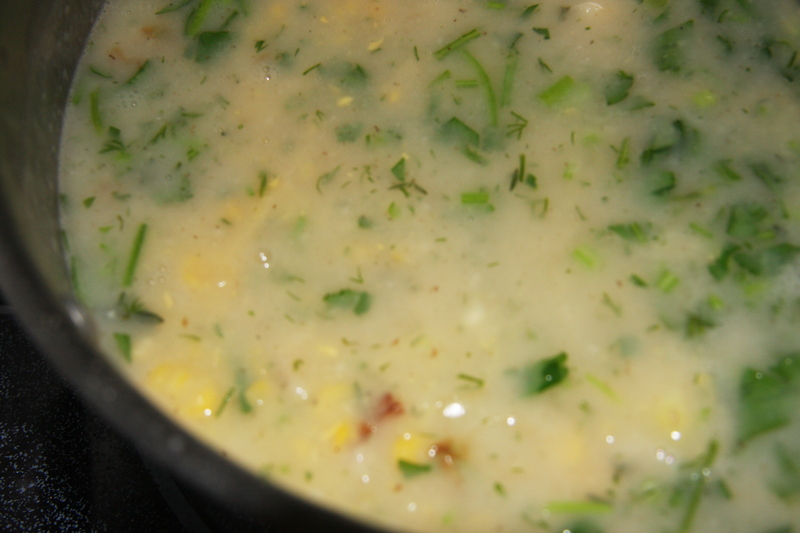 Then add 2 smaller cans of creamed corn and cook until the potatoes are soft. Always checking and mixing this so it doesn’t stick to the bottom. Pour in 3 cups of milk. Heat. 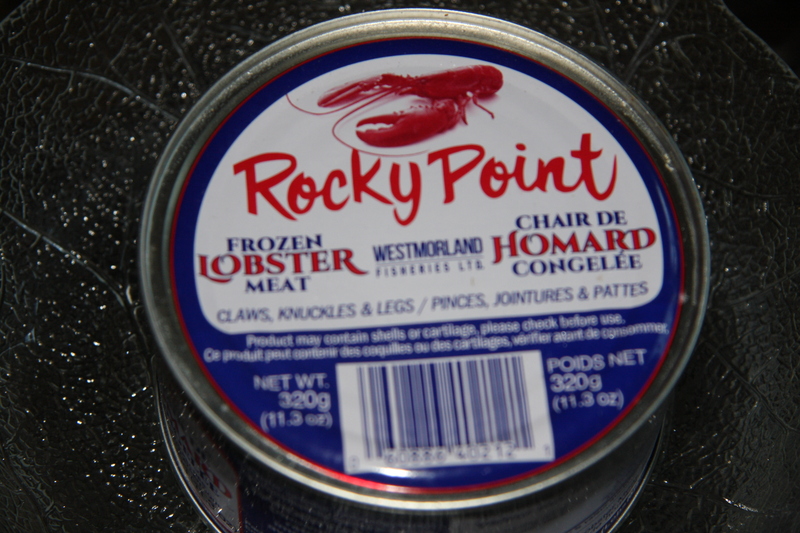 This is frozen lobster that I purchased in the fish department of my local grocery store. I defrosted it chopped it… Put the lobster into the soup and let it heat up. Then the chowder goes into serving bowls and it is ready to eat. Or serve it family style. You can serve this with nice crusty bread or rolls and a nice fresh green salad. But don’t forget it’s also great on its own. Enjoy! Fry onions and butter together until onions are translucent, next adding your garlic and frying for a few minutes but be careful not to burn it. Add 1 cup of boiling water. Adding your potatoes to the water along with the parsley, dill, salt and pepper. Cook at a medium low heat until the potatoes are cooked. 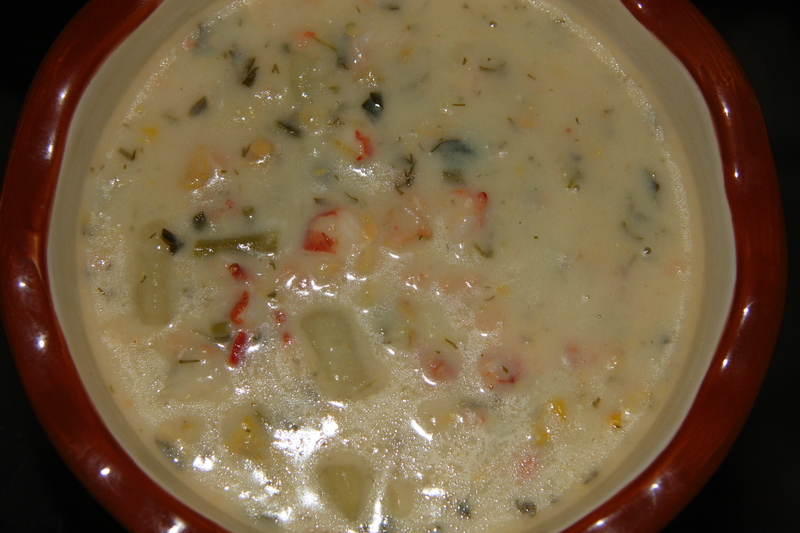 Next add your cans of creamed corn, letting this cook for 10-15 minutes. 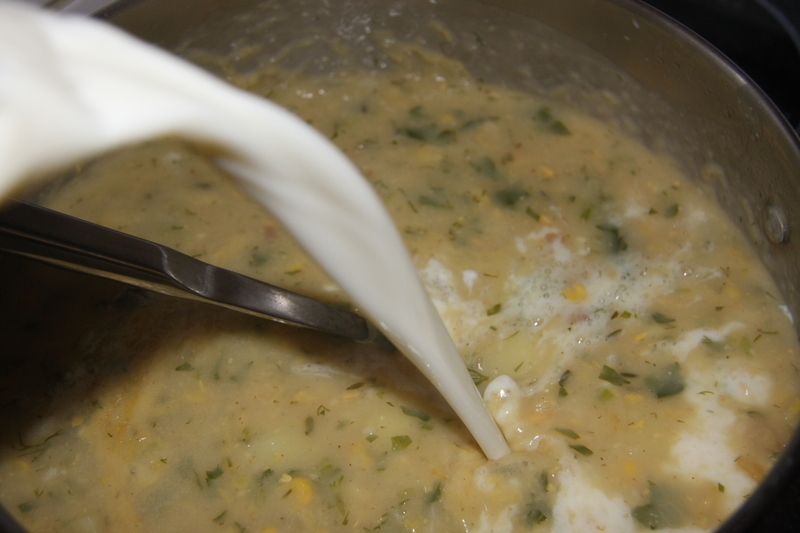 Add your milk along with a 1/4 cup of flour which has been dissolved in a 1/2 cup of water. Heat but do not let it boil. At the end, place your lobster into the chowder. When the chowder has been heated through out, it is done. Serve with fresh crusty bread and a beautiful fresh green salad. Enjoy!